Ho ho ho! It’s almost Christmas and we do have two very exciting announcements for you! We all know that Cassandra Clare’s Queen of Air and Darkness is going to be published on December 4, 2018 and since this is the conclusion to The Dark Artifices, we thought it’d be fun to read Lady Midnight and Lord of Shadows together to prepare for the final installment. But then we thought, why stop at The Dark Artifices? 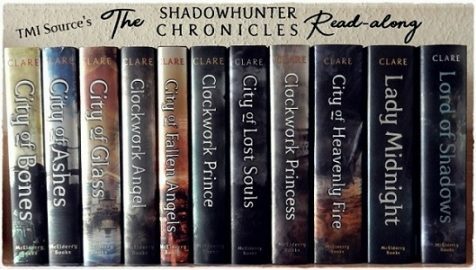 Let’s reread all (or nearly) all of Cassie’s Shadowhunter books! And that’s exactly what we are going to do for the next eleven months! We are going to discuss each book on the last Saturday of the month on Twitter unless otherwise stated – the exact time is going to be announced at the beginning of January. We will tweet questions about each book, share our favourite parts and much more! We are going to use #TSCreadalong to keep track of all of your tweets. But, that’s not all! Since the year is ending, we also want to thank our readers/followers for another great year. That’s why we are giving away some super cool The Dark Artifices stuff that we got at Cassie and Holly Black’s event in London back in August (thank you, Simon & Schuster UK). 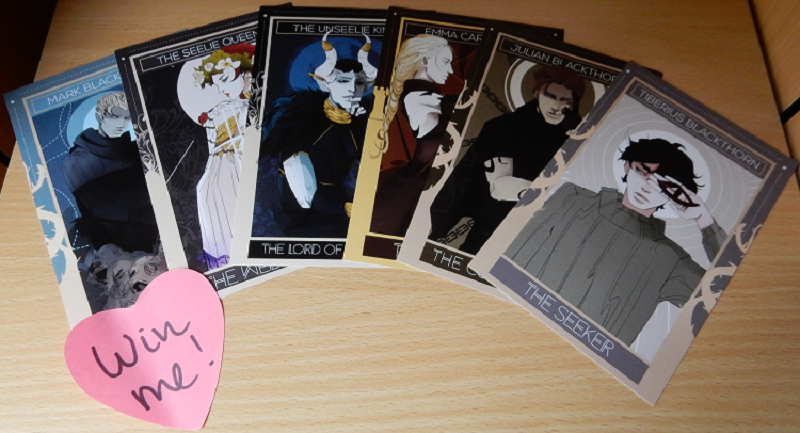 One fan is going to win a Julian and Emma poster by Loweana and another one six The Dark Artifices postcards by Aegisdea (these plus nine additional postcards are also sold on TopatoCo). All you need to do is follow the instructions on Rafflecopter. All mandatory options have to be completed – we will check! The giveaway is going to run from December 25 (12 am UTC +1 but still December 24 for a lot of you guys) and end on December 31 (12 am UTC +1). The winners will be chosen on January 1, 2018. Good luck and have a wonderful rest of the year and an amazing 2018! 🙂 We hope we are going to have lots of participants for our read-along! 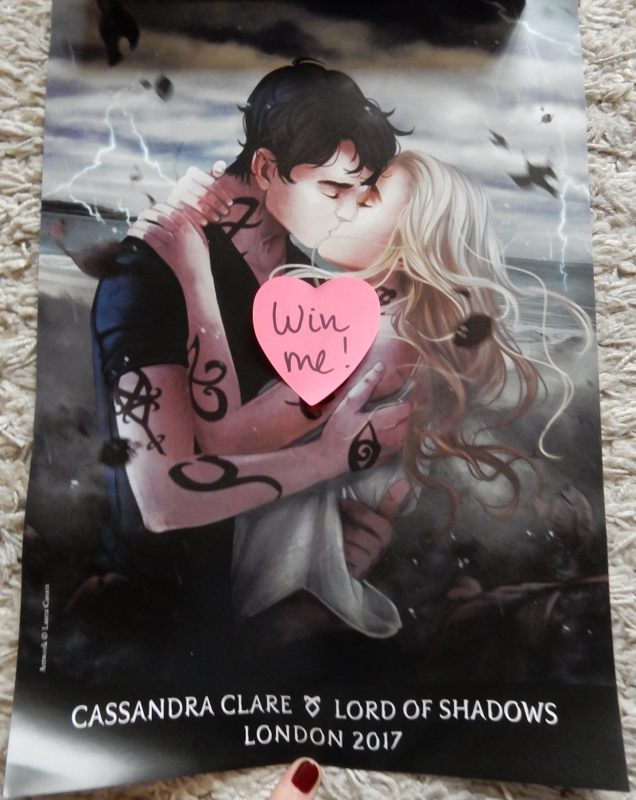 If you do have any further questions about the giveaway or the read-along, please tweet @TMI_Source or @Catreads. So excited about the readalong! I’ve been wanting to reread all the books for such a long time! Thank you, Rachael! We can’t wait for January and hope you’re going to have a lot of fun rereading TSC. I would like to kiss Will under the mistletoe.😀😏💓💓 I love rereading TSC! I would love to kiss Will! Any day! Haha! I am pretty excited for this read along. I don’t know if I will be able to only read one book a month. I would love to kiss Will! Any day! Haha! I am pretty excited for this read along. I don’t know if I will be able to only read one book a month. I adore the series too much. hmmm… why did Cassie have to give us such good options!!! I would want to kiss Mark under the mistletoe. I love Marl because he so different and special. I think it would be funny to see him get reacquainted with Christmas and how he would react to the mistletoe!!!! Wow I’m so excited for the read along! I would like to kiss kit under the mistletoe. OMG!! So amazing!! Thank you so much for giving us this opportunity!! I cannot wait. I have just re read the whole series. I don’t mind doing it again!!!!!!! I would love to kiss Will or Jace!! Too many great choices. I think it’s down to Will, Jace, and Julian. 😂 Can’t choose ♥️ Happy Holidays! I´d like to kiss Will ❤ kisses from venezuela !!! i’d totally want to kiss Jem! This giveaway is such a great opportunity, btw. Thank you! I would love to kiss Magnus orJace, because they’re my favorite characters + the MUST be really good at kissing! I would absolutely give anything to kiss Will under a mistletoe. I would want to be in Emma’s shoes when kissing Julian under the imaginary shadowhunter new year’s mistletoe. Their passion is built on a long shared past, emotionally charged present and terrifyingly enigmatic future. All they have is the cursed love that will empower their mission. This would create the most magnetic and amazing kiss I could ever imagine. I would love to kiss Will or Julian! For the question, my answer would be definitely Will Herondale. Who would I kiss under the mistletoe? Well, this is easy! Will Herondale, of course! P.S: pretty exited for reread all the books I need to refresh my shadowhunters knowledges! It’s soi good to have enought books to read one per month! This giveaway is so amazing, thank you for the opportunity! And I’d definitely kiss Magnus! Will herondale! Thank you for hosting this giveaway and read along! I would kiss Jem. His passion for music and good heart made me fall in love with him. I’d kiss Will. He was my favorite character in the infernal devices. I would like to kiss Magnus. My bestie and I are so excited about this. Can’t wait! Will or Jules, I’m torn haha! I’m currently reading the The Infernal Devices (started before I saw this read along) so I would have to go with Will. Closely followed by Julian! I would love to kiss Jem. Will. Or Jace. But probably Will. I would love to kiss Will, Jace, Jem or Julian under the mistletoe ❤ They are so well developed, I love their passion, their personalities, I just love them and adore them ❤ Thank you very much for doing this giveaway, it's fantastic. I have read the books three times and in a future I am sure than more. I’d LOVE to kiss Julian. He is my fav character. I’m in LOVE with the poster and the postcards! I’d LOVE to kiss Will. He’s my favorite character. He is a cinnamon roll! Thank you for the chance to participante, generosity is an admirable quality. I’ve been growing up with Cassie and I’m surf I’ll die reading her xD TMI helped me through some difficult times and everytime I face a bad time I search guidance un those books. Pd: Sorry for the typos U.u autocorrector ¬¬ ! This is a very difficult decision but I will chose Simon! He is my little cinnamon roll! This is such a hard question…. but I guess I would kiss Mark. I’d kiss Magnus, but not sure Alec would be ok with that aha ! Anyway kissing any of the characters would be great. Thanks for thai opportunity, i’m currently reading TID and i love it! The characters have become part of my life, they’re so special. I’m pretty sure that I’d kiss Will. I love him so, so, so much, and he looks like a great kisser. 😉 Hopefully Tessa won’t mind! Can I have both Jem and Will?